I’m really excited to say that I’ve got a brand new product from a brand new company to share with you today! 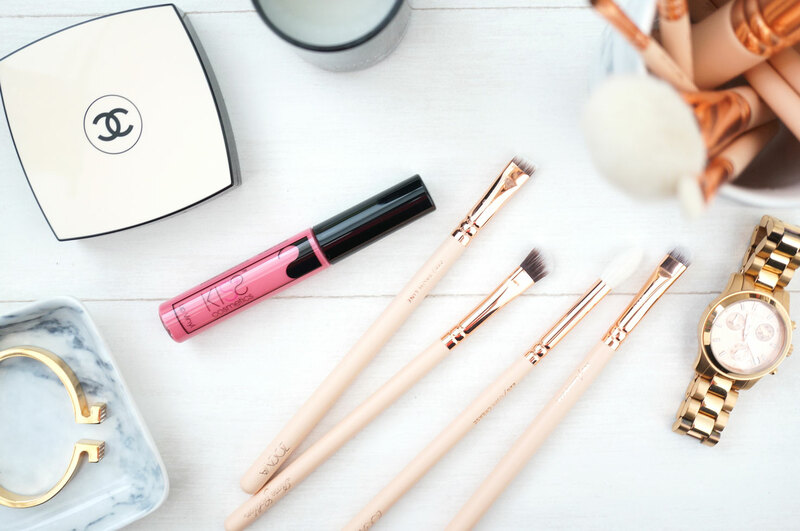 Kiss Cosmetics are the new kids on the blog in the world of makeup – specifically lip products (at the moment anyway). They’ve recently launched with a selection of 10 KISStick lipsticks in a range of shades to suit every skin tone. Their second product, Locked Lips is launching tomorrow, and their Lip Vinyls which I’ll be reviewing today will be available at the beginning of May. I can tell you that Kiss are a brand that listen to what people want. I’ve actually been aware of Kiss Cosmetics for quite a while – possibly since last summer if I remember rightly. They set up a secret Facebook group where bloggers and MUA’s could give honest feedback while they were developing their products. From the shape of the lipstick bullet to the colour of the packaging, Kiss wanted input from the people that would be using their products, and it looks like they listened! So lets take a look at the Lip Vinyl. This is a liquid lipstick offering extreme pigmentation with a high coverage gloss finish. 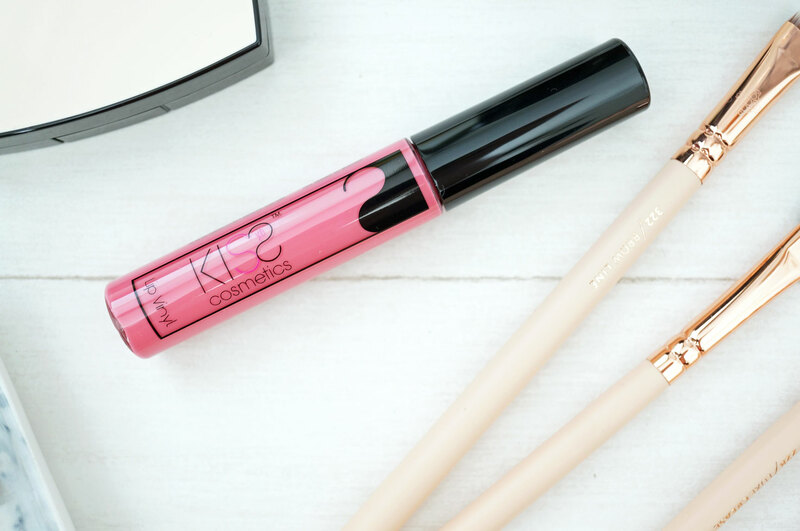 It’s basically a lipstick / gloss hybrid, giving you the best of both worlds – the pigmentation of a lipstick, with a non-drying formula and application of a gloss. Liquid lipsticks are everywhere at the moment, and you probably know already that I’m a big fan of matte and velvet formulas from the likes of Jeffree Starr, Lime Crime and Too Faced, so it’s great to see that Kiss are offering something a little different. 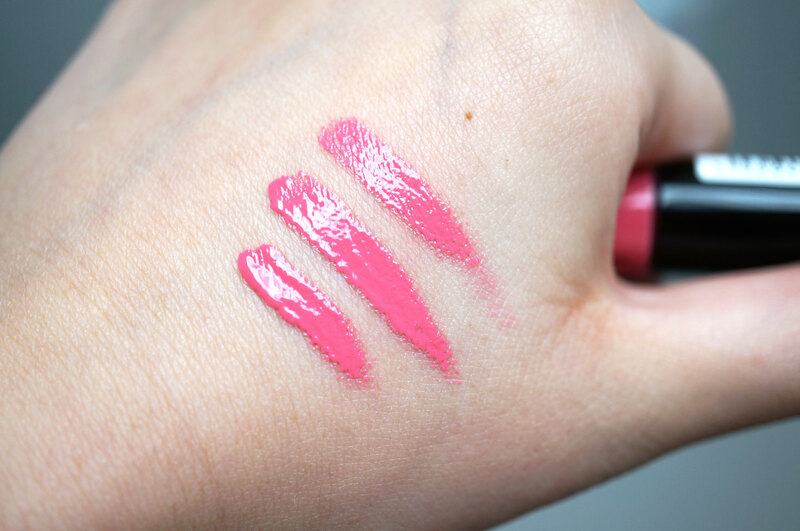 The Lip Vinyls definitely have the feel of a gloss, though the formula is definitely thicker and creamier. 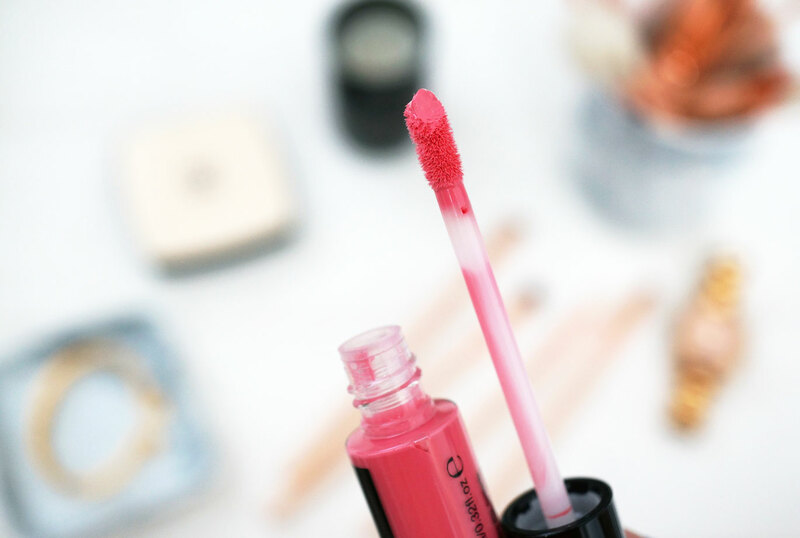 First Kiss is a pretty bright candy pink shade, it’s not sheer at all like you would expect from a gloss though – the colour really packs an impressive punch which I wasn’t expecting! I’ve swatched on my hand for you below so you can see what I mean (Sorry I don’t have a picture of it on my lips guys, my lips are really dry at the moment so it just would’t do the product justice) I can tell you though this does feel hydrating to wear – which is good for my dry lips, but you will lose the glossy finish after a couple of hours – or earlier if you’re eating or drinking. My lips have kept some of the colour but could do with a re-application after about two hours. I’m very impressed with this product, and it really excites me to find out what Kiss will come up with next! There will be 10 shades of Lip Vinyls on offer which will match the already available KISStick lipsticks. The Lip Vinyl Liquid Lipsticks are £7 each from Kiss Cosmetics, and they will be available from 06/05/25. These products look great and I like the colours. I love liquid lipsticks. These have just gone straight on my ‘need to try’ list!